A few weeks ago we went to visit my Aunt and Uncle in what I like to call the country. They live on a piece of property off the beaten path. It is a wonderful quiet spot and I love to go there and relax. And an added bonus...my cousin was there too! I am no photographer, but I do like to take shots here and there. I took a few pictures, and I also took a ton of the kids. 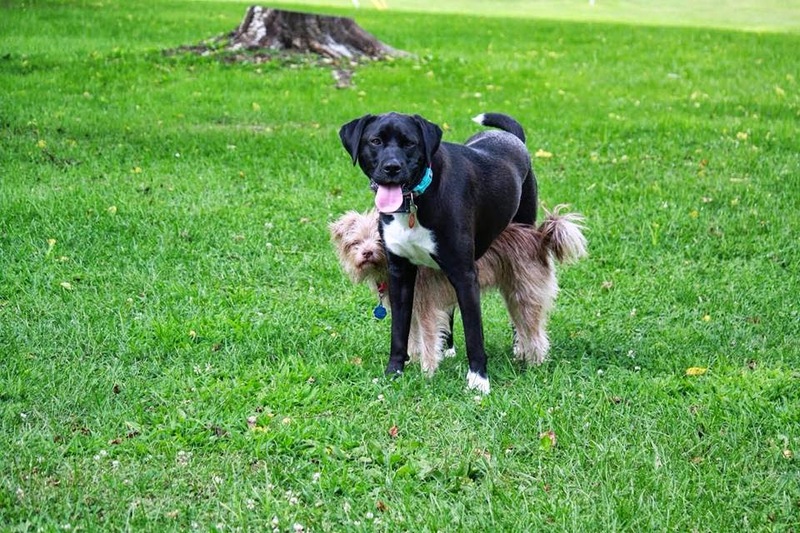 They have so much fun in the country. There is so much to explore. This is my favorite picture that I took from that weekend. You know me and my obsession with fences. I love this picture of the guys just hanging out on the picnic table. It is no telling what those silly boys are talking about! I love how they are all wearing blue. And then Layla & Auntie are heading up to see what the boys are doing. And a country weekend just wouldn't be complete without some golf. There is so much country space we usually don't have to worry about broken windows! This little man wore himself out. He was bussyyy! Layla covered every open sidewalk or driveway space with chalk. That girl loves to write, doodle and draw. This picture of the changing leaves is priceless! And when the kids are done playing golf and chalk, lets play with a stick and rope. They had a ball slinging sticks with a rope attached. It made me laugh! Layla was loving it! She was laughing like crazy, doing a ribbon dance routine. And dad just had to join in on the whole stick and rope thing too. He is the one trying the rope to the stick. So he just had to try it out! Break time in the hammock. The break lasted 2.3 seconds. KP took full advantage of the empty hammock!! Until Hayden was begging him to "get out and play wif me!" We had a wonderful time with limited cell phone reception! Everyone needs a break from technology! It did me good, but thank goodness my camera worked. Fun times like these have to be remembered in pictures! I am loving the breeze blowing into my house right now...it is sunny but breezy and really is just a perfect day. We are supposed to get rain, but I don't think it will happen. 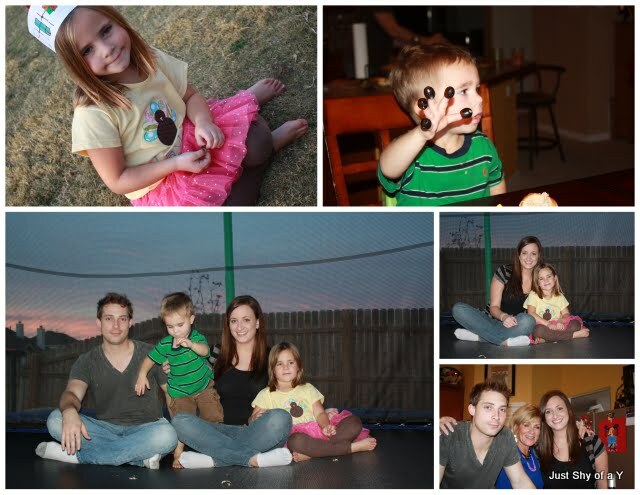 We had an amazing Thanksgiving week. I am so sad the kids had to go back to school. We were loving playing and spending time with friends & family. It was amazing....I can't wait until the kids are out for Christmas break! This little girl is so silly. She makes me laugh so hard! Kids are so impressionable y'all! On Friday night we watched the Taylor Swift special. It was on Thursday, but we were too tired to stay up to watch it. We love our DVR!! But, ever since Layla saw TS with a sweater that was 'off the shoulder' she has been walking around with all the necks of her shirts stretched out. Gary and I try not to giggle every time, but it is just too cute. I love that Layla sees singers and actresses on TV. I want her to see everything she can. I will shelter her from some things, but you know...kids are exposed to so much. It is our jobs as parents to explain the things the kids don't understand. Why hide the world from our kids? We should parent them and explain things they don't understand. When my friends and family talk rude about singers and movie stars it drives me NUTS! They are people too. If your best friend wrote a song and sang it would you go around saying they are a horrible singer. Probably not. So what gives people the right to talk smack about people they don't even know. Ok, sorry! Off my soapbox. Who is anyone to judge anyone else?? I'm not saying I don't judge people, I do, and I shouldn't and I am working on NOT doing it. Hayden really wants this. Even though we already have one a Mrs Potato head. Sheesh! Do you eat turkey and dressing for Christmas? I try to do a different menu. I'm thinking enchiladas this Christmas...we shall see. I don't like to make the same thing within a few weeks. BUT I have had so many people ask about my cornbread dressing recipe. So, just in case you are having dressing for Christmas I am posting my dressing recipe this week if you want to use it. It is pretty easy and it is Gary's grandmothers recipe combined with my family's recipe. Our hall decking festivities were a bit stressful yesterday. I looked back through my blog and saw that almost every year except one, we put the tree in the corner of our living room. Gary and I decided we needed a change. We wanted to put it closer to the fireplace. But once we placed it there, and moved the furniture, it looked weird. So we moved it back to it's regular spot only to find out half the pre-lit lights were working. Blah! What a pain in the rear. Christmas tree lights are not my department. Thank goodness I have the most patient husband ever. He got us back in action. For a bit I thought we might have a bonfire in our back yard...ha! After we finally got the lights working and then had a discussion with Layla about why all our lights are clear. (she wants multi-colored) We put the ornaments on. Actually Layla and Hayden put most of the ornaments on. Gary didn't touch the tree after he got the lights working. He went outside to put timers on the outside lights. We already put them on the house, thankfully! If we had to hang them today too, we would have skipped them. All the drama of where to place the tree and the lights not working did us in!! 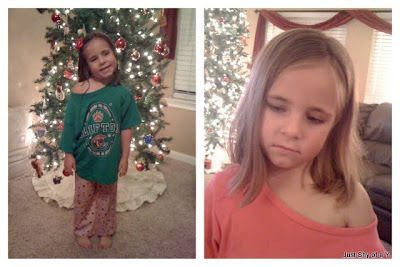 I am not real picky about my Christmas tree, so the kids had a blast hanging all the balls and ornaments. It was really ornament heavy at the bottom, so I just helped place some on the top half of the tree and we called it a night! The kids are so happy to have the tree up! Hayden kept saying it was for Santa and then Layla kept telling him Christmas is about Jesus. Christmas is so FUN with kids. 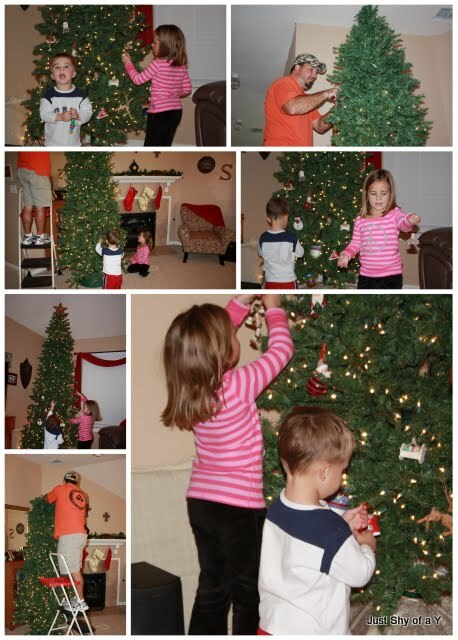 I love this time of year and the excitement in their eyes makes it all worth the stress of putting up the tree! On Wednesday Gary and I cooked for his family. Me Maw, Aunt Susan, Kristin and Rob (Susan's kids) came to have lunch with us. On Thursday we went to my parents house. My Grandparents were there as well as my Aunt Pat and Uncle Maurice. 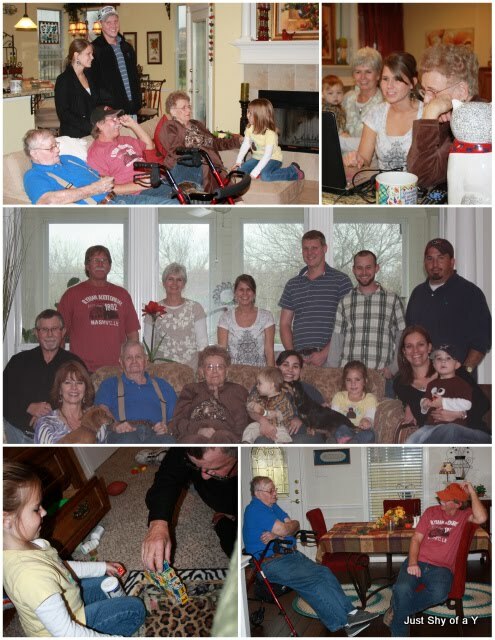 We also got to see my cousins Craig and Kacie and their families. It was a large crowd with good food! And what a difference a day makes in the weather. It was 40 degrees and so cold on Thanksgiving day. That is Texas weather for ya! I am very thankful for all the blessings in my life! Today, Gary and I have been preparing our meal for tomorrow. Wednesday we are having his family over for our Thanksgiving dinner. I am so happy! I love to cook and entertain so Thanksgiving is so fun for me! I have found in years past it is too hard to do it all in one day. We did some preparation today and will finish up in the morning before we eat at noon! Gary cooked the turkey all afternoon, and then I used the broth for my mother in laws cornbread dressing recipe. The dressing turned out so good! I can't wait to devour my meal tomorrow, and then do it all over again on Thursday at my family's celebration at my parents house. And of course no dinner would be complete without deviled eggs, olives and pickles! I hope you all have a wonderful celebration. I know that many people don't eat what we eat for Thanksgiving. What is on your menu for Thanksgiving day? And after two days with zero pictures, I promise to post with pics soon!! I love Thanksgiving! It is one of my favorites!! I am thankful for so many things this year. I thought it only seemed appropriate to share those things with you all! My husband. He is my best friend. I can tell him anything and enjoy every evening I have with him after the kids are tucked tightly in bed. We laugh, watch TV and talk about our days. I am thankful for him and this time. I am thankful for my kids. I love them more than I ever imagined I could. They are the sweetest kids. I love being their mom and I am so thankful I was chosen to be their parent. I am thankful for their good health. I am thankful for my Harley dog. I know she is sad right now missing her side kick...Callaway. 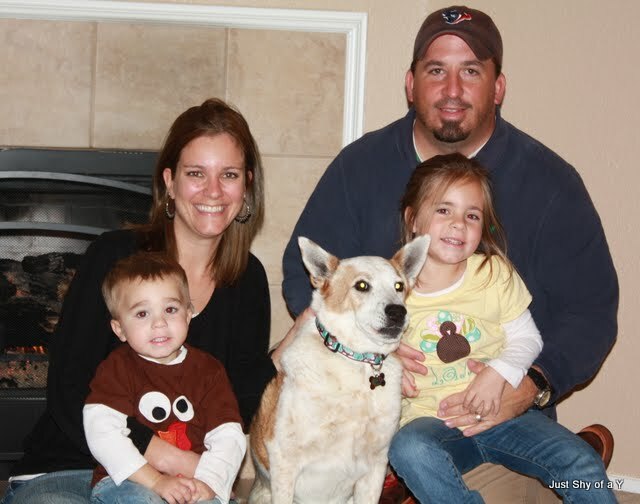 I am thankful to still have one dog. And I am thankful for the 12 years I did have with Callaway. I am thankful for my house. I love my house. I am thankful for my kitchen. I love to cook and am happiest when I am cooking and making yummy healthy meals for my family. I am thankful for all the fun kitchen gadgets I have collected over the years. I am thankful for my friends...my in real life friends and family, and my twitter & blog friends. I have been so blessed with tons of friends and I love them all. Each person I know has touched my life in one way or another and I love them all! I am thankful for my relationship with God. I love that I can talk to him anytime about anything. My relationship with him has helped me become who I am today. He has helped me with trials and tribulations and also shined through me in happy times. I wish everyone could have the relationship I have with God. It is amazing. I am thankful for my iPhone. I am thankful for my new coffee pot. It gets me going in the morning. I am thankful for my camera, all my recipe books, our backyard, the Sharper Image speakers that play whatever music we are in the mood for. I am thankful for my comfortable pillow and soft kooshie bed, my snuggie, my Vera Wang wine glasses, and my cast iron skillet. I am thankful for great smelling laundry detergent, candles and fingernail polish. I am glad that I can change the color polish I am wearing when ever I want. I am thankful that I am able to make my own choices. I am thankful for the person I am. I am proud of myself and who I have become. It has taken me a long time to become confident in who I am. I was a nervous first time parent, but parenting has changed me as a person. I love this and hope that I continue to grow and change into an even better person!! Oh and of course I am thankful for turkey, mashed potatoes and pumpkin pie :) But REALLLLY thankful for cornbread dressing...oh how I love it! We had the best lunch on Wednesday with Hayden and all his little preschool classmates. I had a great time visiting with a few of the other moms. Rebecca's mom and I shared recipes...that is right up my alley! Hayden loves his classmates. He and Jake are the only boys (2 boys & 4 girls), and I was told that Hayden kissed one of the girls on Monday. GREAT! It has already started. He comes home every Monday and Wednesday talking and talking about all his fun adventures. He tells us all about sliding down the slide and singing songs in chapel. He just has the best time. I am so thankful that Hayden likes his preschool. Layla did really well at the same school. Hayden had a few rough weeks getting used to everything, but now he loves it! 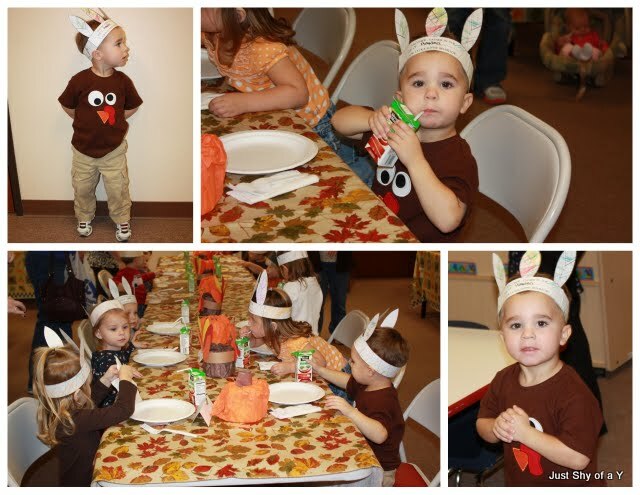 And aren't Hayden and Layla's turkey shirts just adorable?? I have gotten so many compliments on their shirts! We can't wait to wear our turkey gear this coming week when we celebrate Thanksgiving! This weeks theme at Kelly's Korner is Playrooms/Bonus Rooms/Laundry Rooms. I posted our playroom a few weeks ago when we did Guest Bedrooms. So I will post a few pictures of the playroom again, and also my laundry room. We recently got a new washer and dryer. I love my new energy efficient washer and dryer. I love all the fun settings and how much better they work. Gee our old ones were like 50 years old I think!! I decided against getting the front load washer and dryer set. I am a very low maintenance girl, and when it comes to a washer and dryer I like practical. I love the top loading washer, and having a curious toddler...I wanted to stick with what I am used to. Hayden already got a step stool and tried to climb into the washer...wow! He'd be chilling out in there if it were front loading. I am so happy with my new set! My shelves are full of baskets with various things in each of the baskets. I have a basket of nails, double sided tape and anything you'd need to hang a picture. I also have another basket of batteries. With all the toys we have we are always changing batteries...gotta have those things on hand. One basket holds light bulbs. And one is full of cleaning supplies. The last basket is full of old cleaning cloths. I also store my vacuum cleaner, swiffer, brooms and shark in the laundry room. As well as the iron and ironing board. I'm not sure why I have the iron...we never use it! HA! I have the craziest paint going on in here...it is wild. I went to Lowe's and got paint form the discount shelf. I just got whatever they had on hand. The green was $2.50 and the maroon color was $5.00 for a gallon. I am in the laundry room so much, I wanted fun wild colors! Next I plan to get some fun pictures to liven up the walls. See my tool set on the shelf above the dryer. It is mine. I love having my own tool set. It makes me feel really handy...ha! And once again, the playroom. We love our playroom. We spend a ton of time in here! We rarely have company that spends the night, so we decided to turn the guest bedroom into a playroom. IT is the BEST decision we made. It works perfectly for our family. We have all the dresser drawers filled with toys. One drawer has all the plastic dishes and food that go with the kitchen. Another drawer has play telephones and Mr Potato head parts. One drawer has so many balls in it, it will hardly close. And the same for the drawer overflowing with toy cars. The two middle doors are filled with games and puzzles. Hayden decided to pour every single puzzle out onto the floor the other day. I will never get that mess cleaned up. I feel like throwing the puzzles away and buying new ones. There were a million pieces and now they are all mixed up...ridiculous!! Seriously shouldn't someone be watching that kid. Another funny thing about this storage dresser...the two top drawers handles are broken. It is wonderful!!! I store all the kids movies and crayons in those two drawers. Only Gary and I know how to get into them...ha! So I don't mind that the handles are broken. Otherwise Hayden would break all the DVD's and then color all over them...teehee. We love to lay the futon down and watch movies in the playroom. Our plan is to get a new TV in here. As I said in an earlier post I still need to do more decorating, running around chasing a 5 year old and a 2 year old is keeping me pretty busy as of late! Thanks for stopping by our house. Hayden has done well being in preschool 2 days a week. He is learning songs and his ABC's. He could already count to 10 before he started preschool. To me it is crazy that he learned his numbers before his ABC's...Layla was the complete opposite. If there is one thing I have learned about being a parent it is every kid is different!!! I really wish new moms would realize that, and not beat themselves up by comparing their kids to others. OK, back to my handsome boy :) Hayden recognizes most of his shapes and really tries on his colors. His favorite color is yellow, and he can tell what is red and green. He struggles with most other colors, but we are working on it. Hayden loves sports. He loves to toss the football in the backyard, or the house. ha! He broke one of my wine glasses the other day. It was empty, but oh what a mess. Glass was everywhere. He felt so bad. He loves to play golf, and he is getting so good at it. He can also hit the baseball off the tee. I am pretty sure he can do any sport he wants. He is so athletic. He loves to jump on the trampoline. It is so cute to see him get better and better at doing silly tricks as he jumps. I crack up every time I see Hayden run...he chases his sister and still has that silly toddler run. Hayden has become a picky eater, but I don't worry about it. There are certain foods he loves so I serve those when he hasn't eaten in awhile :) He loves carrots, pinto beans, and french fries. He can drink his milk or juice in 2.3 seconds. I just don't get that...he acts like he is so thirsty all the time. If I would let him I am pretty sure Hayden would eat butter plain. Any chance he gets he sticks his finger in the butter dish. That's my boy!! His favorite lunch is chippies and peanut butter and jelly. I still try all the time, but he won't touch broccoli or green beans. I'll never give up...those are two of my favorites! Hayden is talking so much. This morning he said "I feel bettar". He just got his diaper changed and he was happy to be clean. By the way, that makes me happy...he is really hating dirty or wet diapers right now. He will walk like a silly man so it doesn't touch him. Legs spread all wide and stuff. I hope this will end in us getting diapers out of our house for good! Anyway, back to his developing vocabulary. He is stringing words together and making small sentences. He says "welcome" instead of thank you! But we get what he means. He cracks me up if I ask if his pants are wet...he says "no I perfeck." My hickups gone. He is obsessed with hickups! Oh there is nothing like toddler speak!!! As you can see in most of the photos I post Hayden loves to wear a baseball cap. He has four and loves to wear each one! He grabs whichever one he is in the mood for. He has recently decided he really likes TV and his favorite TV show is Mickey Mouse Clubhouse. He loves it! 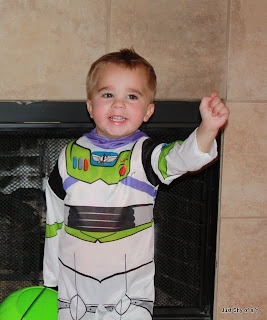 He is also a huge Woody Buzz (Toy Story) fan. One day he watched all three movies in one day...he played with me while we watched them, so it isn't like we just sat and stared at the TV for 6 hours straight. And I could go on and on and on!!! I feel like I have just rambled on, but that is what mommies do... right? So, there is an update of our 27 month old lovable boy!